I have spent a lot of time playing Skyrim. One thing that I have noticed is how lonely playing the game alone can become. Soon enough, that will all change. A modder who goes under the alias, Seigfre, has developed a semi-functioning modification that allows players to play with friends. 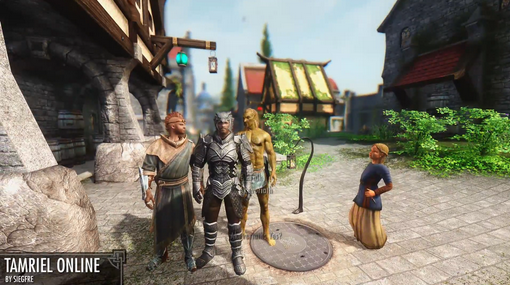 This mod works by tracking basic movements and allows you to see your friends, unlike previous attempts. Currently, the only thing you can really do at this time is explore with one another. This is Siegfre's first modification, and it has been in development for two weeks. It allows you to play with as many as your friends that the server, and Skyrim can handle with or without using the same mods. Do keep in mind that it has not been released, but has been given to the public for testing purposes. However, I believe if the community works together, this mod could potentially be one of the best Skyrim mods to date. Currently, the only things that is synchronized between both games are character positions, rotation, changing cells/fast travel, armor, weapons, height, width, equipping, dequipping, basic customizations, stats, names, walking, running, jumping, sneaking, and other basic combat synchronization. Seigfre stated that once he gets his work published on Nexus, he will begin working on synchronizing the world state and npcs. He also plans to create an API so that other modders can add networking components to their mods. Overall, this is a early stage mod that can be crafted to near perfection with the help of the modding community. Since so many others have failed at attempting an online multiplayer for Skyrim this is as close as we have gotten. With the right help from other modders, this modification can change your Skyrim experience entirely.